Thrill Cosby - "Oogity Boogity"
Kasper - "Turn Tricks On The Side"
Alexi Delano - "Would You?" Review: Magda, Troy Pierce and Marc Houle's occasional label Items & Things makes a welcome return, featuring four more superlative grooves from Marc Houle, Kasper, Thrill Cosby and Alexi Delano. 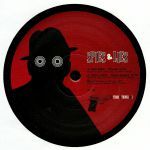 The label was created as an outlet for the weird, experimental and beautiful sounds the trio often come across on their travels and "Spies & Lies" fits the bill perfectly, containing music that will stimulate, overwhelm and confound in equal measures.